Adina Prestige White Wine Glasses Set of 2 (P/N 4900162). The Spiegelau brand is synonymous wi..
Avignon Chardonnay Wine Glass—1 Stem (P/N GL538). Artisan metalworkers cast and finish e..
Bottega del Vino Chardonnay set of 4 (P/N BV05-4). Mouth-blown and hand finished, each stem fe..
Bottega del Vino Chardonnay Wine Glass (P/N BV05). Mouth-blown and hand finished, each stem fe..
Bottega del Vino Chardonnay Wine Glass Set of 2 (P/N BV05-2). Mouth-blown and hand finished, e..
Gabriel Glas Set of 2 (p/n 96817). Choosing a suitable glass is often more difficult than choo..
Italesse White Wine Glasses Set of 2 (P/N 17425). Introducing the next-generation of mouth-blo..
Lucca White Wine Glasses 6 Stems (P/N 150.03.02). These stunning machine crafted glasses are l..
Riedel O Champagne Flutes (P/N 0414/28). If you appreciate the avant-garde, impress your guests with..
Riedel O Viognier/Chardonnay—Buy 6 Get 8 (P/N 5414/85). You can now fit your wine g..
Riedel Sommeliers Alsace Glass (P/N 4400/05). This stately glass rises from the table on&..
Riedel Sommeliers Chablis-Chardonnay (P/N 4400/0). Everyone is talking about the return of C..
Riedel Sommeliers Montrachet 1 Stem (P/N 4400/07). A crisp White Burgundy is one of summe..
Riedel Sommeliers Rheingau Single Glass (P/N 4400/01). This elegant, tulip-shaped glass with a..
Riedel Sommeliers Riesling (P/N 4400/15). Riesling expresses more notes and finish on ..
Riedel Vinum Cuvée Prestige Set of 2 (P/N 6416/48). Bubbles are one of the best pa..
Riedel Vinum Montrachet/Chardonnay Set of 2 (P/N 6416/97). A spherical bowl distingu..
Riedel Vinum Sauvignon Blanc Set of 2 (P/N 6416/33). Do you love Sauvignon Blanc? Get the gl..
Stolzle Revolution Power Wine 6 Stems (P/N F 377/01). Shown on the right with red wine, the st..
Stölzle Revolution Sparkling Wine 6-Pk (P/N F 377/07). 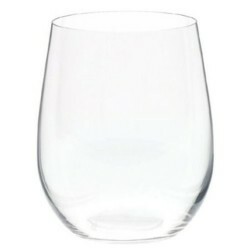 The straight conical shape charact..
Ultima Chardonnay Glasses - 6 stems (P/N 200/01). Favored by winery tasting rooms, Ultima Stemwa..
Shatter-proof your outdoor parties! Easily mistaken for fine crystal, these polycarbonate Chardonnay.. The world's most break-resistant wine glasses! Super-strong, lightweight magnesium is fused..